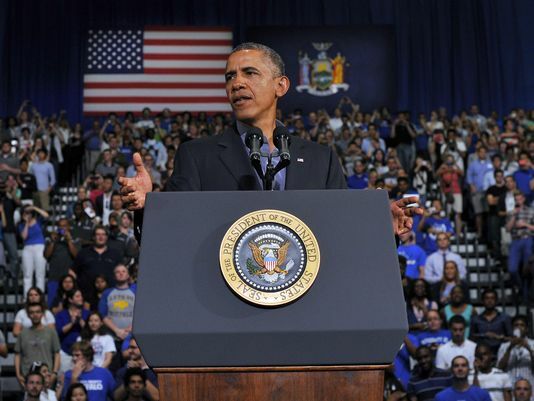 After President Obama’s speech at the University of Buffalo yesterday, there was a firestorm of commentary. The Chronicle notes the mixed reviews of the proposals and public college endorsements. The President touted a new ratings system that would be tied to aid and therefore, the net cost of attending an institution. That ratings system was discussed in the New York Times and was also mentioned on the Roosevelt Institute Blog. Reform in the cost/aid ratio is a long overdue. Higher education is nearly unattainable for most without some kind of loan package. Access and net cost for higher education is related and the discussion is how to make that more fair. Perhaps some of our elite institutions are hiding their value behind ultra selectivity. Moreover, internal grade inflation problems have not gone undetected in some of these elite universities. Princeton had to deal with those charges head-on. The idea is to create more transparency for consumer choice and to tilt subsidies to higher performing schools. This sounds reasonable in theory. However, we won’t know what any of this will look like until a rating system is devised. That’s where things can get really sticky, really fast. For example, such a system may have unintended consequences for the community college system which is currently the most affordable source of higher education. The plan is not unlike the Spellings Plan which was highly criticized by accreditation bodies and universities alike. Obama’s plan includes better transitions from secondary to post-secondary schools, consumer transparency, and value based on performance-based outcomes. But the Obama plan also includes incentives for institutions to enroll lower-income students which the Spellings Plan did not. Skeptics of the Spellings Plan were concerned that the principles behind No Child Left Behind would be applied to higher education. The Obama plan re-introduces those principles of ratings, value-added, return on investment, and performance. There is cause to be concerned at how these metrics will look and how they will impact college choice. These are symptomatic issues. The deeper philosophical issue is this: When we say “value” in education, what do we mean? North Carolina governor Pat McCrory infamously said that aid would be given to state institutions “not based upon how many butts in seats but how many of those butts can get jobs.” The value of education in this language is clear – higher education is about jobs. Learning is in the service of the economy. If higher education is not creating an able workforce, then why would we have it? How much debt does the average student leave with? How easy it is to pay off? How many students graduate on time? How well do those graduates do in the workforce? Because the answers will help parents and students figure out how much value a college truly offers. Certainly employment is vital and is one reason many students seek a higher education. But there is a basic principle that we must not overlook. Is education for the end of creating a workforce? The political rhetoric seems to point in this direction. If the focus is on jobs, “The narrow educational focus on economic development is alarming because it places the market in control of the curriculum” (Ayers, 2005, p. 546). So who is truly controlling the end of education other than market forces and the government’s assumed responsibility to create skilled labor? Education for this end has lost its understanding of value as the cultivation of the mind and the development of truth, beauty, and goodness as an ends in themselves. Such endeavor has no short-term return on investment in a society that values instant gratification. Value in this kind of society is measured by how much money one can make, and how much money one can deposit back into the economic system. Education by sleight-of-hand is in danger of serving this political agenda that could undermine the nature of education itself. There is no such thing as a neutral educational process. Education either functions as an instrument which is used to facilitate integration of the younger generation into the logic of the present system and bring about conformity or it becomes the practice of freedom, the means by which men and women deal critically and creatively with reality and discover how to participate in the transformation of their world. Ayers, D. F. (2005). Neoliberal ideology in community college mission statements: A critical discourse analysis. The Review of Higher Education, 28(4), 527-549. Freire, Paulo. (2000) Pedagogy of the oppressed /New York : Continuum. p. 34.